Accommodation at the Hotel in Puerto Madryn. Breakfast. We will leave from Puerto Madryn to Puerto Piramides, crossing the isthmus Carlos Ameghino. This is a special place because of its geography allows simultaneously observe the Nuevo and San José gulfs. Visit the Interpretation Centre. It then continues to Puerto Piramides, where only town briefly tour the center of the peninsula. Here, only during the months of July to December, it is possible to embark on an unforgettable experience of watching the stunning Southern Right Whale (optional), which reaches these shores to mate and give birth. Continue to Caleta Valdes, a strange formation of 35 m. facing the continent. This place is unique not only by geography but also by its fauna in the reserve of Punta Cantor-located at the mouth of the cove-elephant seals await, 3000 kg creatures frolicking on the beach and snorkeling over 1000 m. deep. Since the points located on the outer sides of the Creek you will enjoy the most stunning views of the Argentine Sea. The road continues to the Faro Punta Delgada. This place is a historical monument of nature, that appropriates the human construction and chrome finish. Lunch (optional). Maras, guanacos, foxes and skunks: During a Mediterranean cruise back to contemplate the Salinas Grande and Chica (Depressions of 35 m below sea level) and see wildlife is performed. The guide will tell all about the history of Fort St. Joseph and the extraction of salt from the salt. We sail by boat from Puerto Piramides, touring the Nuevo Gulf. We may observe the Southern Right whale that reaches these shores to mate and give birth. The behavior of these great mammals surprising and touching at once, and the ability to watch up close is an unforgettable experience. Breakfast. In the morning visit to Punta Tombo Reserve is the colony of Magellanic Penguins most important of the Patagonian coast Return to Hotel. Accommodation in selected hotel in Puerto Madryn. Breakfast. In time transfer to airport for flight from Trelew to Ushuaia. Accommodation at Hotel of your choice in Ushuaia. Breakfast. Out of town heading west toward the National Park Tierra del Fuego, the only country in the maritime coast, located 12 km from the city of Ushuaia. You will enjoy a ride with several panoramic views of the Beagle Channel, wrapped in lovely surroundings that provide the foothills of the Andes before diving into the ocean and the Andean-Patagonian forest, consisting of tree species diversity: beech, cherry trees, ñires, notros and various flowers such as orchids, violets and senecios. A route between bogs and beaver dams, leading to Lapataia River and Laguna Verde. From there continue along the final stretch culminating in Lapataia. The original inhabitants of the area have left their testimony in 'middens', incredible archaeological sites that provide interesting information about their ancient customs. Return to Ushuaia so began, stopping along the way to admire the Lake Roca, which is characterized by the color of its waters vary by the weather. In the afternoon, departure from the hotel to the Ushuaia tourist pier where we board the catamaran to take us to the island of Lobos and Bird through the Beagle Channel. The tour begins sailing from Ushuaia Bay where an excellent panoramic view of the city surrounded by mountains is obtained. At the end of the bay the Paso Chico indicating the start of the mythical Beagle Channel is crossed. The north coast of the channel borders, passing through the archipelago Bridges to reach the Bird Island, where you can appreciate the diversity of seabirds that inhabit the area, such as cormorants, albatrosses, ducks, gulls, etc.. Later accesses the Isla de los Lobos, which presents an interesting colony of sea lions, a unique opportunity to appreciate while lions and two hairs to understand their differences. It finally reaches the Lighthouse Les Eclaireurs, where the final return to the city begins. Disembark and return to hotel. Accommodation at Hotel in Ushuaia. Breakfast. transfer from the Hotel to airport in Ushuaia. Accommodation at the Hotel in El Calafate. Breakfast. This is the most spectacular and unforgettable excursion in all Patagonia.At the beginning of the tour, you will skirt Bay Redonda of Lake Argentino as well as have the chance to see Solitaire Island. You will go through the Patagonia valley with its natural environment of species such as guanacos, ostriches, foxes, etc. 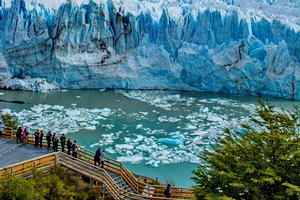 Afterwards you will enjoy many interesting spots: Cerro Comision o De Los Elefantes, river Centinela, Cerro Frias (guanacos site), many Patagonian farmhouses and, across the Mitre river you will get into National Park Los Glaciares. Then, you will go 35 km along the coast of of Lake Argentino’s Rico Branch, among vegetation of incredible trees such as ñires, lengas, notros and cherry trees. Breakfast. In time transfer to the airport for the flight to Bariloche Calafate Transfer to hotel. Accommodation at the Hotel in Bariloche. Breakfast. Chco Circuit Coast Lake Nahuel Huapi is traversed until Llao area, famous for its hotel and residential area. Whether Puerto Handkerchief, Llao Llao Forest and Lake Moreno. The lakes are surrounded by mountains of the Andes mountains with snowy peaks and wooded slopes pines typical of the region. Breakfast. Leaving Bariloche and take the National Route 237 to the north. Once the small river crosses Nahuel Huapi lake, on the border with the Province of Neuquén, at 21km. City, take Route 231 In a winding path of great beauty, which partly passes through the middle of the forest and in part by the shores of Nahuel Huapi lake . ; You will arrive at Puerto Manso and, after traveling 90 km., Villa la Angostura. After this town, along the road happen, one after another, each one of the famous "Seven Lakes" Mirror, Drafty, Villarino, Falkner, Escondido, Beautiful and Machonico. Breakfast. Departure 7:00 a.m. by bus to the Puerto Pañuelos.. The journey starts in Puerto Pañuelo, sailing the Nahuel Huapi Lake, among the mountains towards the heart of the Andes and arriving at Puerto Blest. A 3-kilometer bus ride, bordering the Frias River, takes you to Puerto Alegre. There you set sail for 20 minutes in the green waters of Frias Lake and arriving at Puerto Frias, as you admire the stunning views of the Tronador Mountain and the condors in their magnificent flight. Upon arriving to Puerto Frias, you go through customs. Next, you take a bus which goes through the beautiful Valdivian Rain Forest and arriving in Peulla, in Chile, and completing the customs paperwork to then have lunch (optional). After lunch, you sail the Todos los Santos Lake to Petrohue. When you arrive in Petohue you take a final bus to visit the Petrohue waterfalls and finally, bordering the Llanquihue Lake, you arrive in the city of Puerto Varas, the service of ‘Cruce Andino’ finalizes in the city of Pto Varas. Accommodation in selected hotel in Puerto Varas. Breakfast. At agreed time visiting Frutillar. Pan out to the south to reach Llanquihue, to visit the city, the Industrial District and the Monument to the German settlers. Agricultural and livestock will be present in the tour. Accede to Frutillar, a city known for its architecture, colonial houses, its well tended gardens, and known Musical weeks that develop between 26 January and 04 February each year. Visit the Coastal and Colonial Museum where we can see traces of German colonization. Lunch at Restaurant Espanta bird. In the afternoon continue along Lake Llanquihue to Puerto Octay, founded in 1854, with beautiful architecture of the century people. Day 13 Puerto Montt - Santiago de Chile. In time departure to airport for flight to Chile Transfer to hotel. Accommodation at Hotel of your choice in Santiago. Day 14 Santiago de Chile. Breakfast. Visit to Santiago, founded in 1541, is a mixture between the old and the modern, and we invite you to explore this cosmopolitan place. We will guide you through Plaza de Armas, Santiago’s main square, where the cathedral, the post office and city hall are located. You will be also told about its origins. The next stop is the civic neighborhood and the surroundings of the Government Palace. After that we´ll drive through some of the old neighborhoods of Santiago, like Republica and Concha y Toro; later on, we will visit the eastern part of the city and we'll see the modern buildings and the changes that they have brought to Santiago. We finish our tour in a handicraft store Faba, where we'll appreciate, with a Pisco Sour, some Lapizlazuli masterpieces. Return to the Hotel ..
Accommodation at the Hotel in Santiago de Chile. Breakfast buffet. Departure to Valparaiso, the first commercial port of Chile and a window into the Pacific. Our "Garden city", Viña del Mar, will charm us with its architecture, its streets, palaces, and the Quinta Vergara. We'll drive the coastal border and will visit the port of Valparaiso which goes back to 1536. The city was declared World Heritage by Unesco and currently is the legislative headquarters. Valparaíso is a magical place of unique and unforgettable landscapes with colorful neighborhoods and picturesque funicular elevators. The tour ends at Sotomayor square and the port, where you can sail the Valparaiso bay as an optional activity. Buffet breakfast. Day at leisure for optional tours. Breakfast buffet. Transfer From the Hotel to the airport. This package does not include air ticket. Este Paquete NO incluye billete aereo.